Earth's atmosphere has four distinct layers, as well as a rarefied outer layer that can extend as far a 10,000 kilometers (6,214 miles) from the planet in the absence of solar wind. The lowest atmospheric layer is the troposphere, and the layer just above that is the stratosphere. Among the factors that define these as two separate layers are differences in air pressure, temperature, temperature gradient, wind speed and wind direction. The boundary between the troposphere and the stratosphere is called the tropopause, and it isn't constant. It's about 8 kilometers (5 miles) above the ground at the poles and about twice that at the equator. The tropopause is an isotherm—a region of stable temperature—below which all of the planet's weather takes place. The tropopause typically marks the uppermost limit of cloud activity; instead of rising above this isotherm, large storm clouds typically spread out horizontally in an anvil shape. Certain types of clouds—called nacreous or mother-of-pearl clouds—do form in the stratosphere, but usually only at latitudes between 60 and 90 degrees and only in the winter. Weather patterns occur in the troposphere because the air near the ground is warmer than the air at higher altitudes; this phenomenon is a result of the fact that the ground absorbs and radiates heat from the sun. Because of this negative temperature gradient with respect to altitude, warm air can rise and create a convection current that produces winds and clouds. In the stratosphere, which extends to an altitude of about 50 kilometers (31 miles), the temperature increases with altitude as a result of the fact that the ozone layer in the upper stratosphere absorbs sunlight and radiates heat downward. The tropopause is the region of constant temperature in which the gradient direction changes. The propensity for warm, moisture-laden air to rise and cool air to fall in the troposphere creates winds, clouds and precipitation. Because of local variations in temperature and air pressure, these winds can be irregular and, at times, extreme. In the stratosphere, where the air pressure is much lower and a ceiling of warmer air prevents convection currents from forming, conditions are more stable. There is virtually no turbulence here, which is caused by vertical air movements, and the winds that do exist, although strong, are steady and blow in a horizontal direction. Commercial aircraft fly in the lower stratosphere to avoid turbulence. The troposphere contains about 75 percent of the gases in the atmosphere, and the stratosphere, which has a larger volume, contains about 19 percent of these gases. 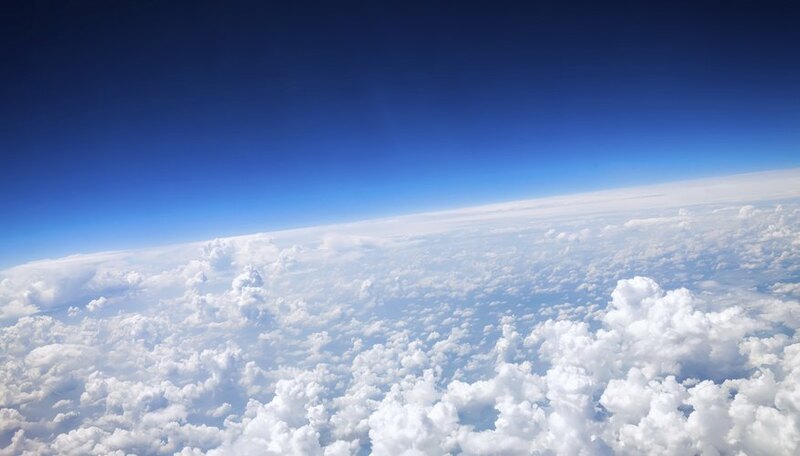 The air pressure in the stratosphere is accordingly lower: on average, the pressure in the stratosphere is only about 10 percent or less of the pressure at sea level. The ozone layer, located at the top of the stratosphere, is one of the most important features of this atmospheric layer. Besides creating a ceiling of warm air that prevents convection currents from forming, it filters out ultraviolet radiation from the sun that would be damaging to life at the surface. What Layer of the Atmosphere Is of the Greatest Interest to Meteorologists? What Kind of Weather Is Associated With Stratus Clouds? Deziel, Chris. "What Is the Difference Between the Troposphere & the Stratosphere?" Sciencing, https://sciencing.com/difference-between-troposphere-stratosphere-8050751.html. 25 April 2017.